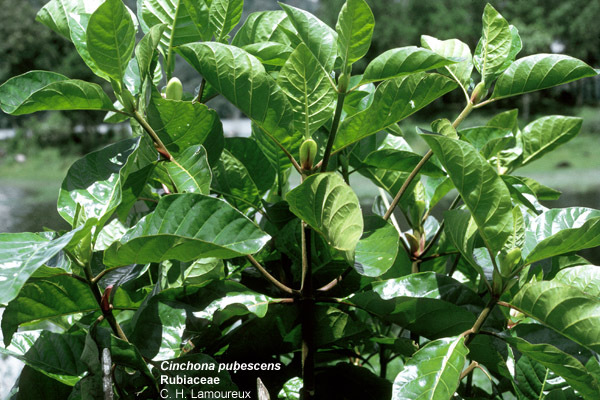 Cinchona pubescens, quinine tree. 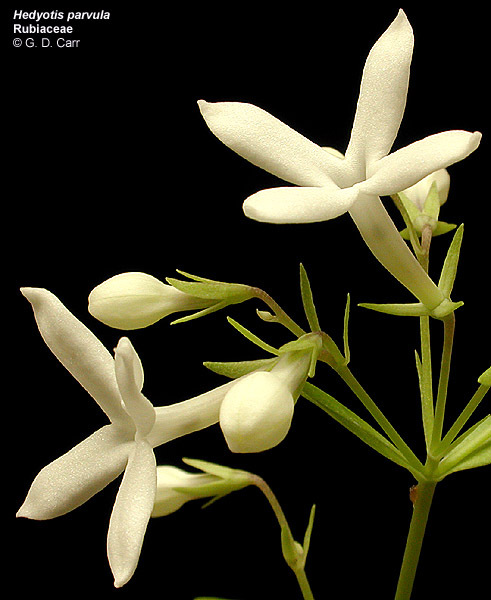 One of the more well-know members of the family because of its efficacy in the treatment of malaria. 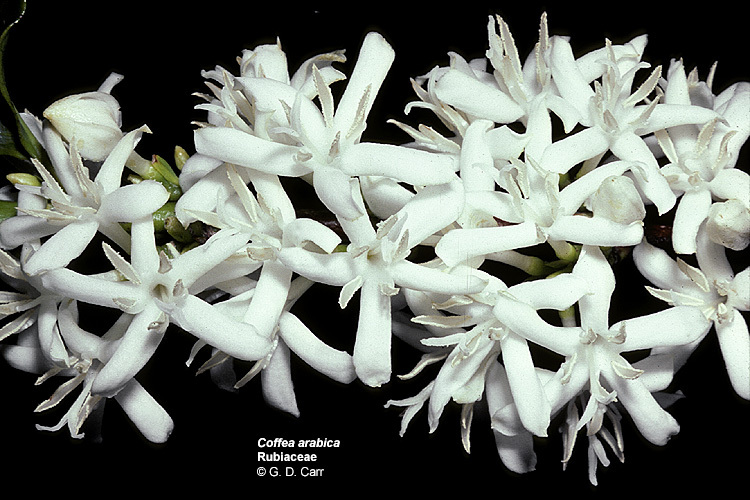 Coffea arabica, Arabian coffee. 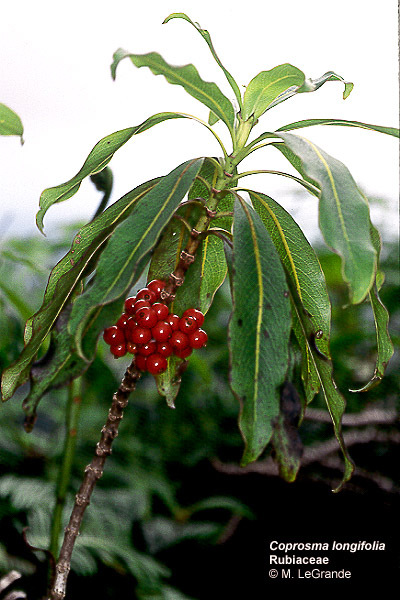 Shrub from tropical Africa, brought to Hawaii by Don Marin in 1813; important commercially for its red berries which are fermented, dried, shelled, aged, roasted, ground, and used for brewing the popular drink. 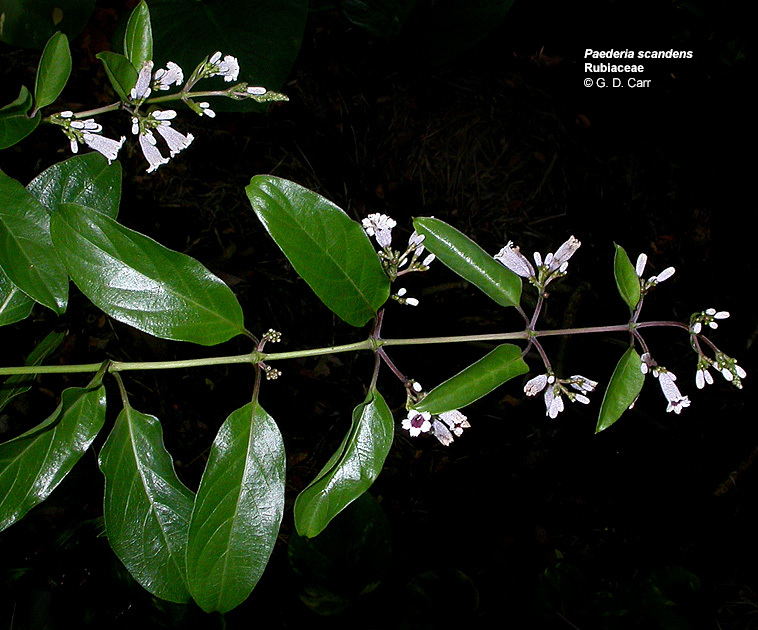 Coprosma ernodeoides, kukaenene. 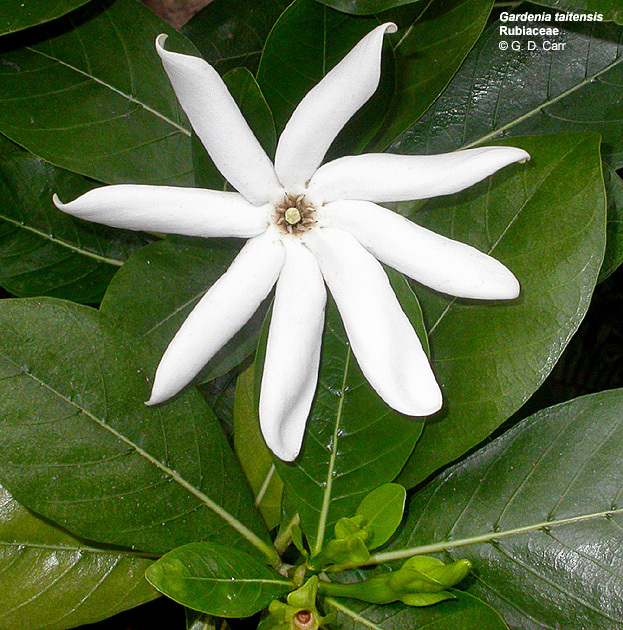 This Hawaiian native genus is unusual in the family because of its dioecious, wind pollinated species. 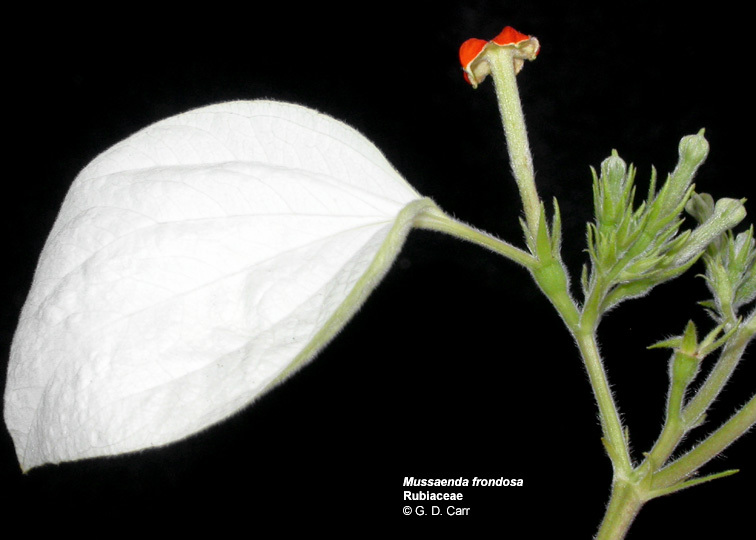 This is a female plant (left photo). Notice the long, brush-like stigmas. 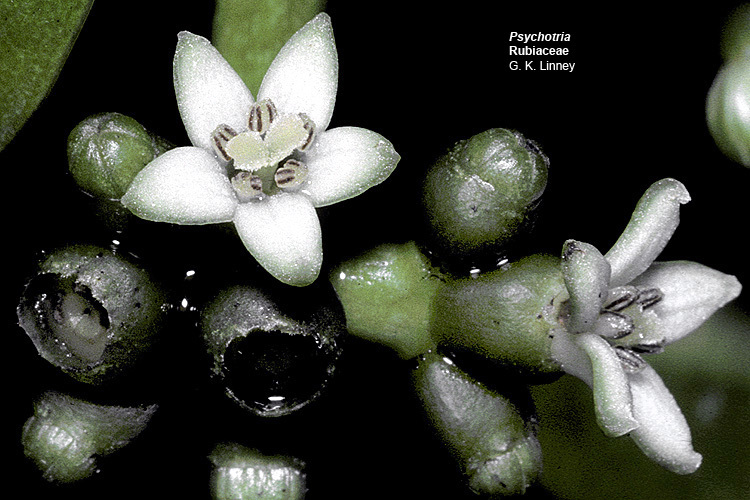 The photo on the right shows a male plant with staminate flowers. 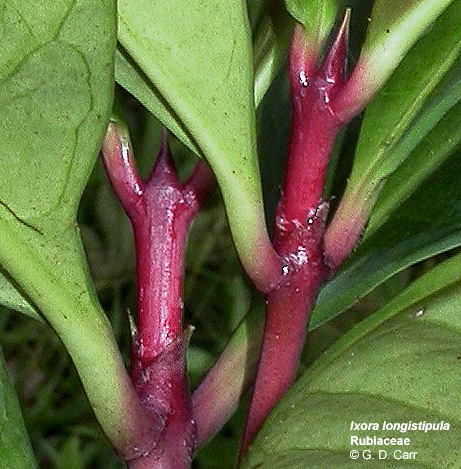 Coprosma longifolia, pilo, hupilo, O'ahu, Hawaii, endemic. 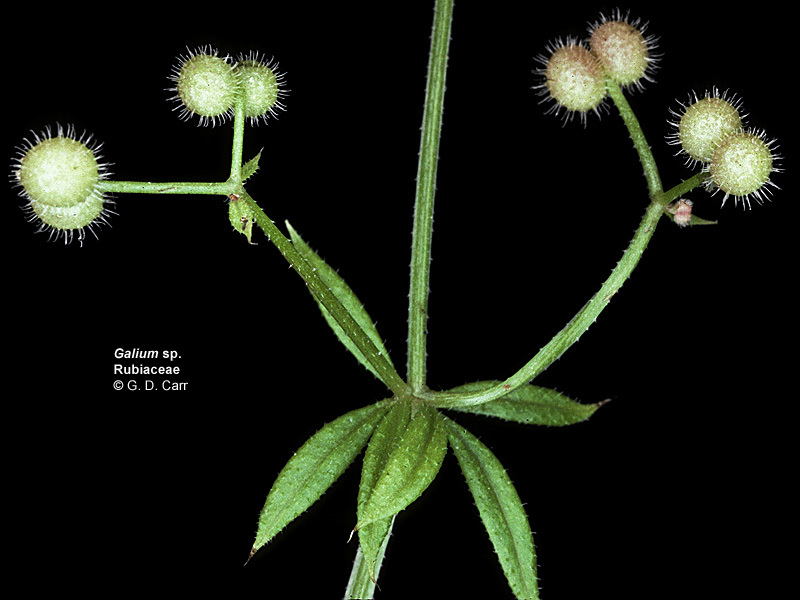 Galium aparine, bedstraw, vic. Alsea Falls, OR, 2002. 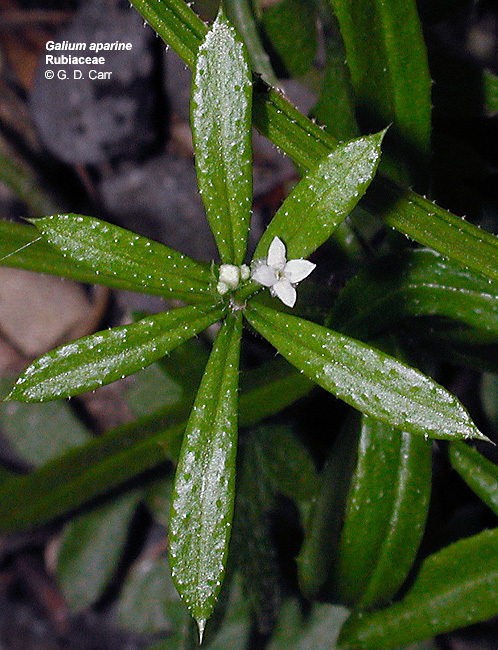 Galium sp., bedstraw. 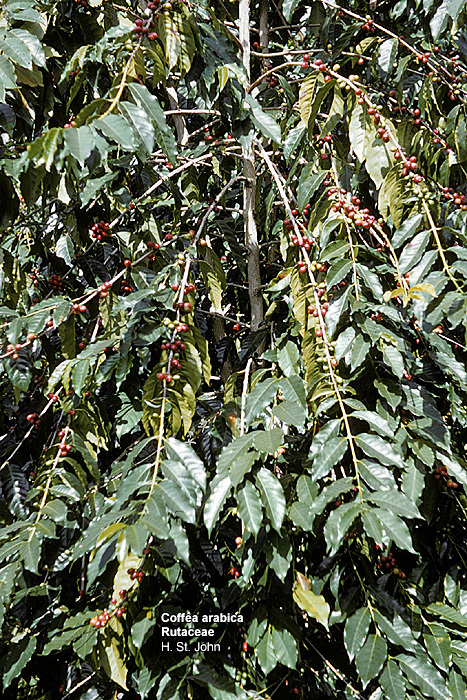 The bicarpellate nature of the fruit is readily apparent. 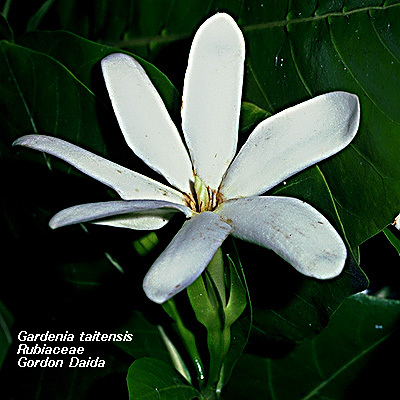 Gardenia taietensis, Tahitian gardenia. 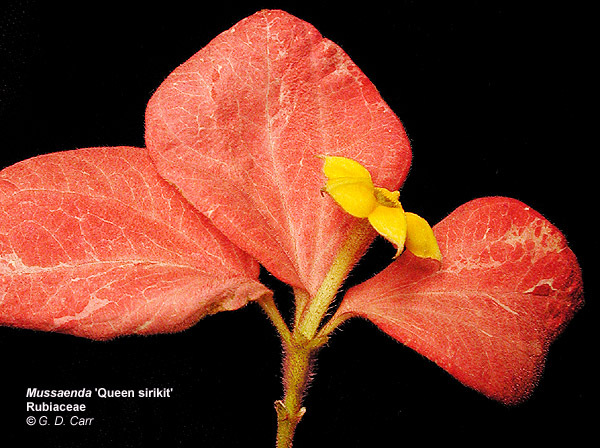 This is an example of the less frequent condition in the family where the number of corolla lobes and stamens exceeds 5. 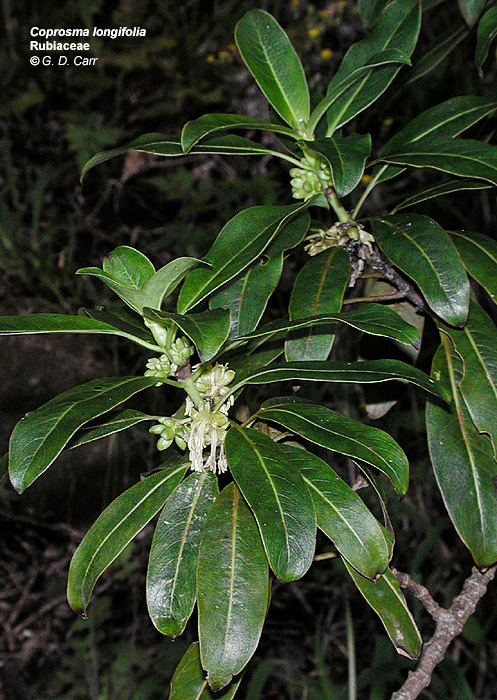 Hedyotis parvula, endemic to Hawaii. 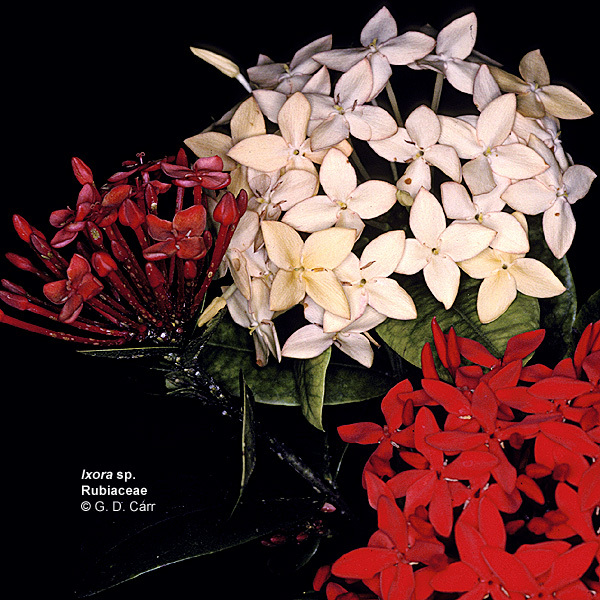 Ixora sp., ixora. 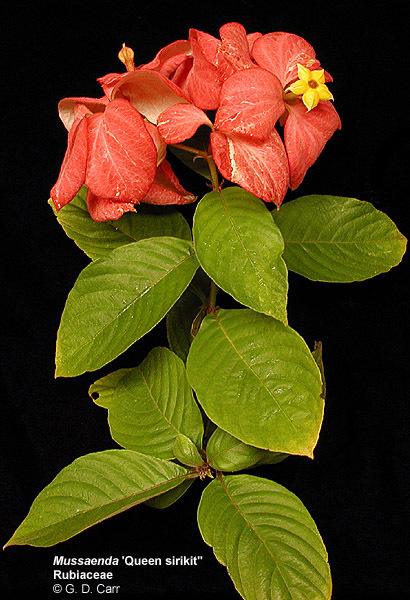 Any of several shrubby ornamental species from tropical Asia, with red, white, yellow or pink flowers. 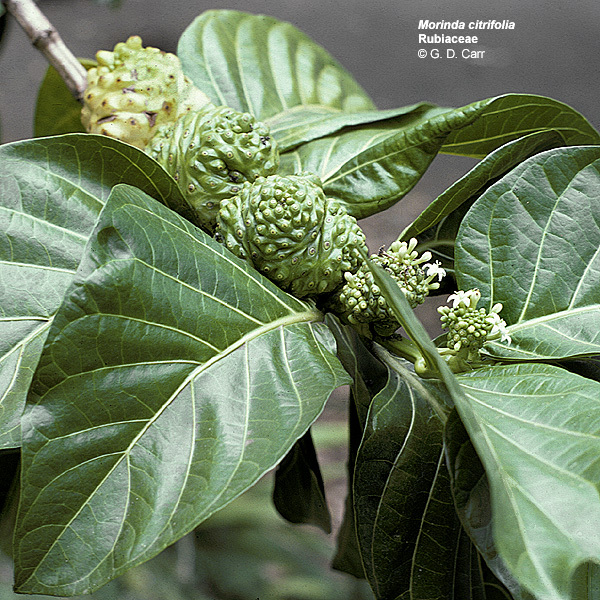 Morinda citrifolia, noni. 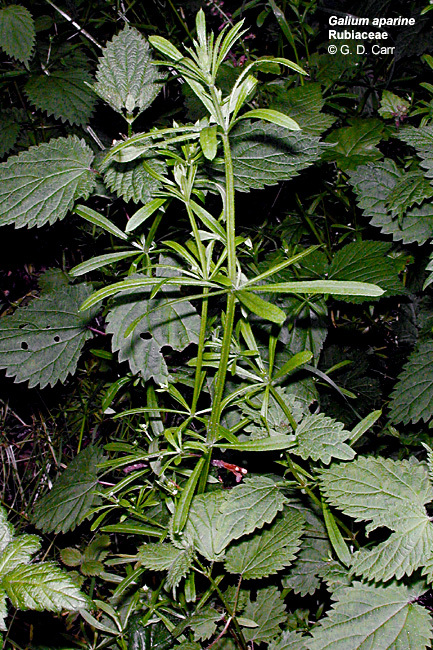 Notice the opposite leaves and conspicuous interpetiolar stipules. 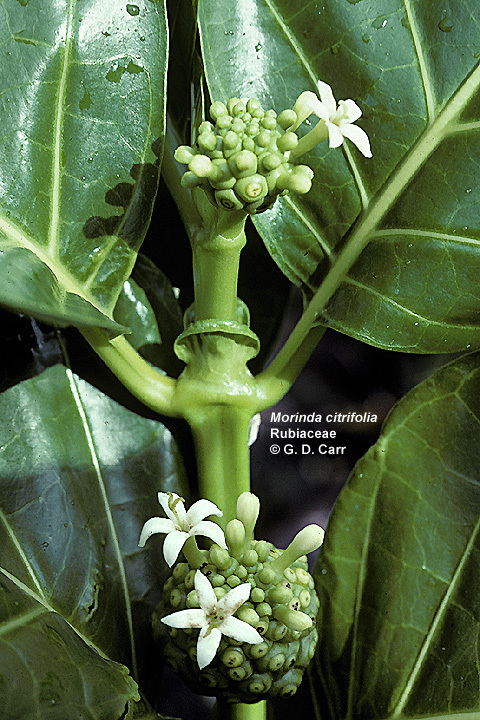 Multiple fruits result from coalescence of the inferior ovaries of many closely packed flowers. 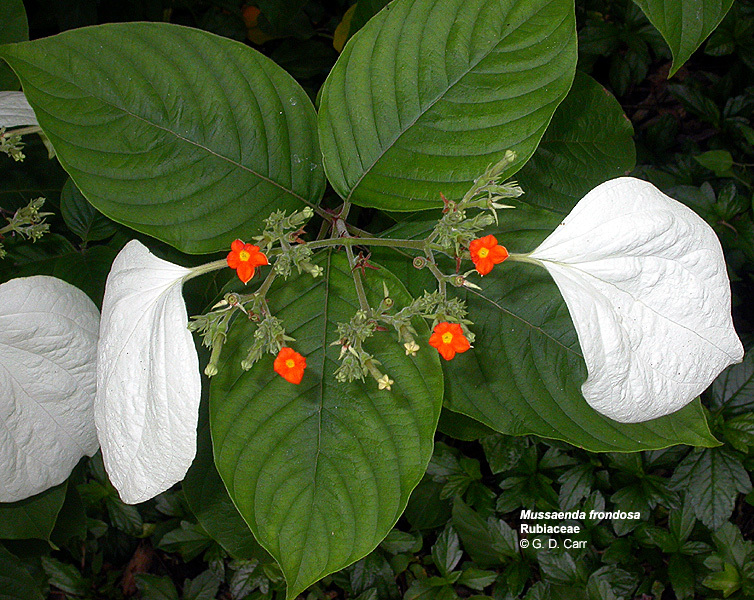 Mussaenda frondosa, Ho'omaluhia Botanical Garden, O'ahu. 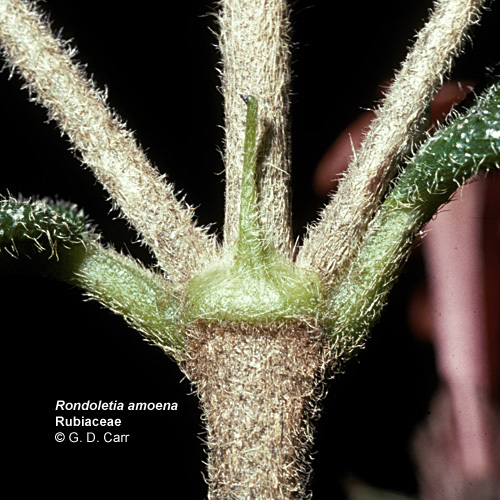 Note one calyx lobe expanded and flag-like on some of the peripheral flowers. 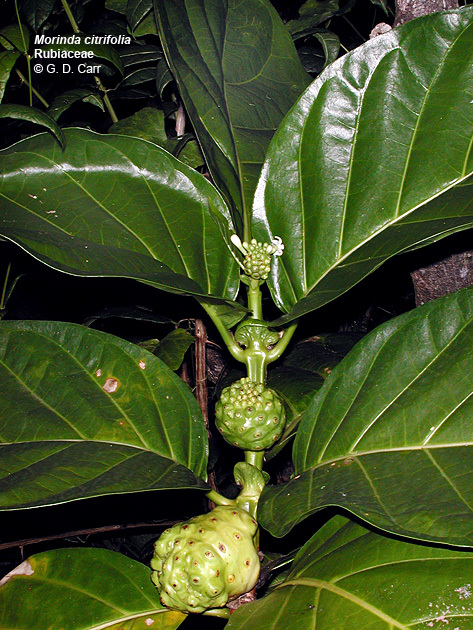 Mussaenda philippica, Ho'omaluhia Botanical Garden, O'ahu. 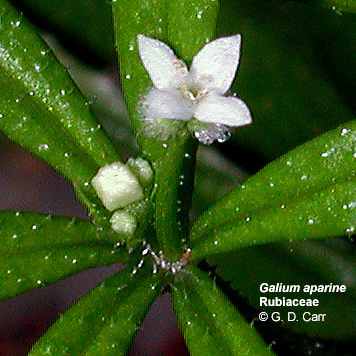 Note all of the calyx lobes expanded in this species. 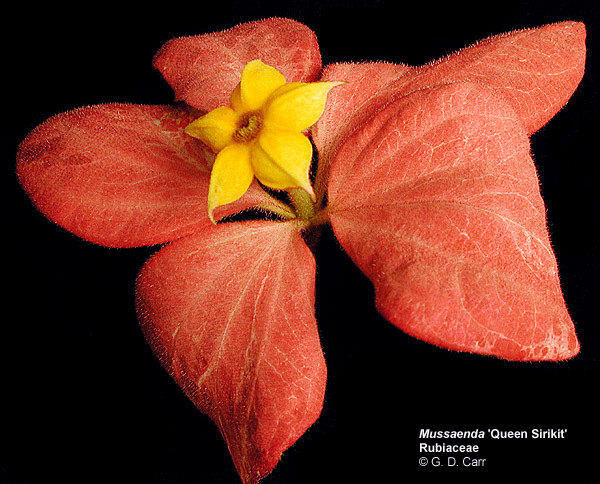 Mussaenda 'Queen Sirikit'. 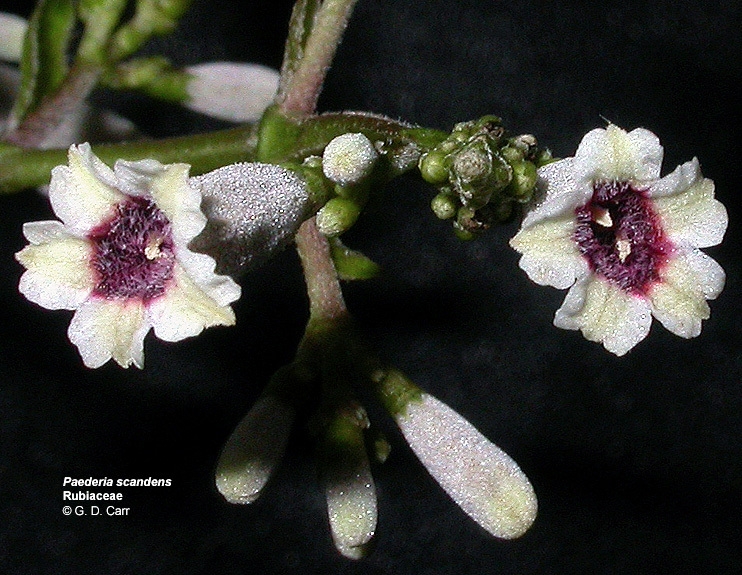 In this species the calyx lobes are greatly enlarged, producing an attractive unit more conspicuous than the corolla (two of the sepals have been cut away in the flower on the right). 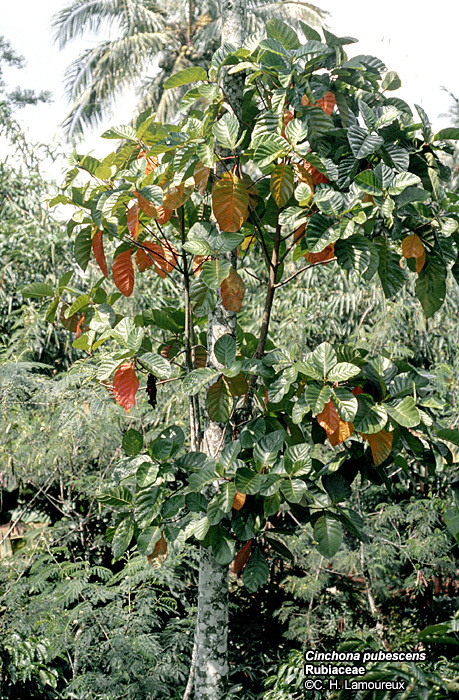 Nertera granadensis, makole. 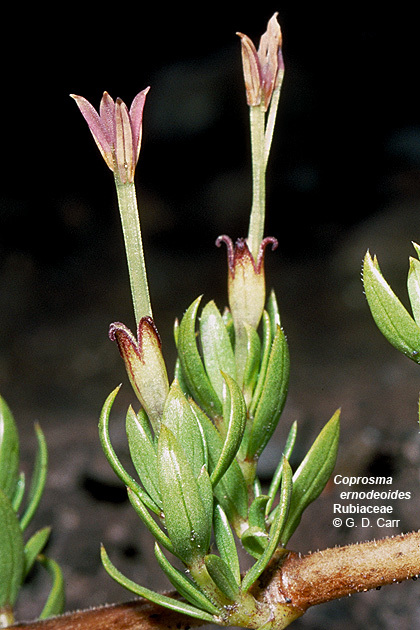 This small, creeping Hawaiian native is found in wet sites. 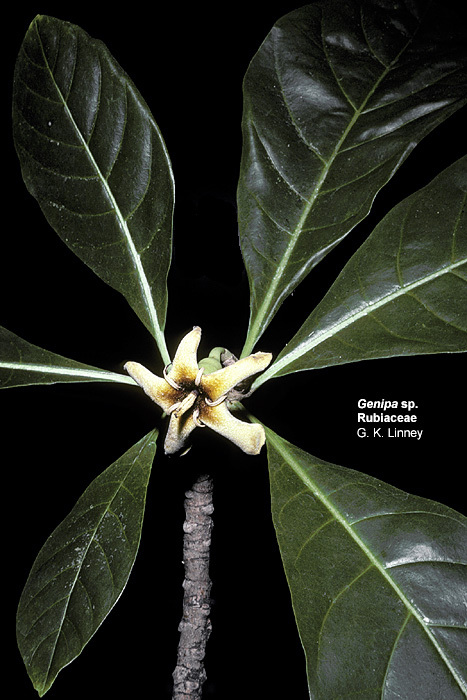 Notice the 4-merous flowers and opposite leaves with interpetiolar stipules. 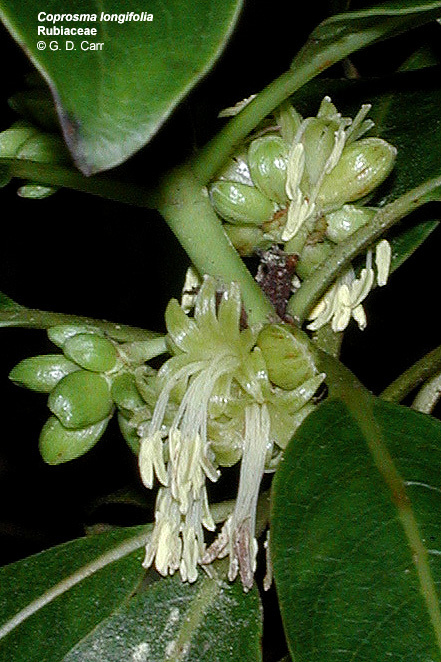 Paederia foetida, maile pilau. 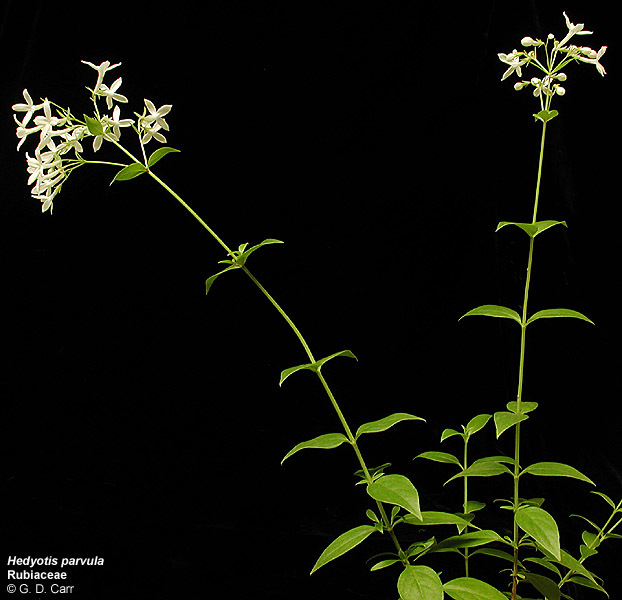 Twining malodorous vine. 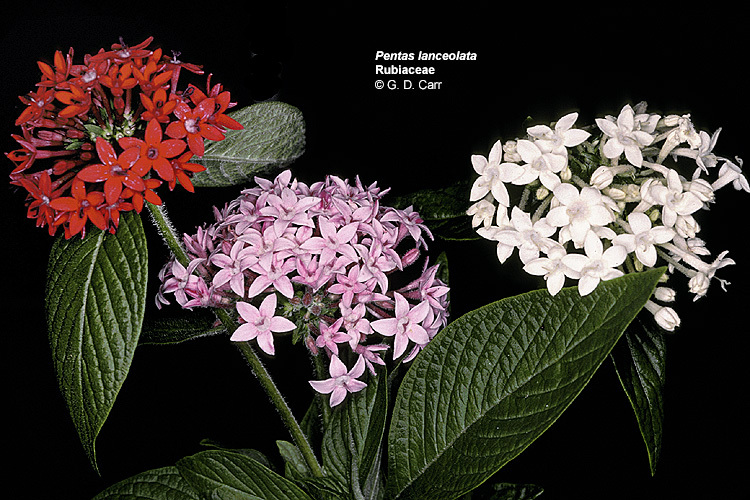 Pentas lanceolata. 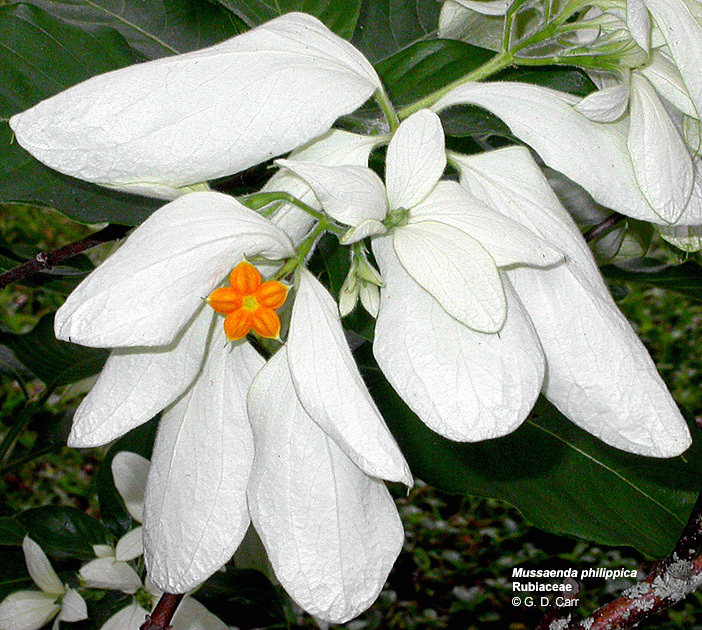 This photo shows three different color forms of this common ornamental shrub. Note the cymose clusters of 5-merous flowers. 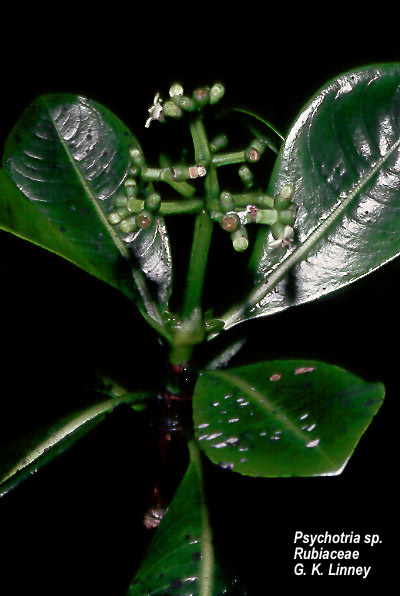 Psychotria sp., kopiko, Palikea, O'ahu, endemic. 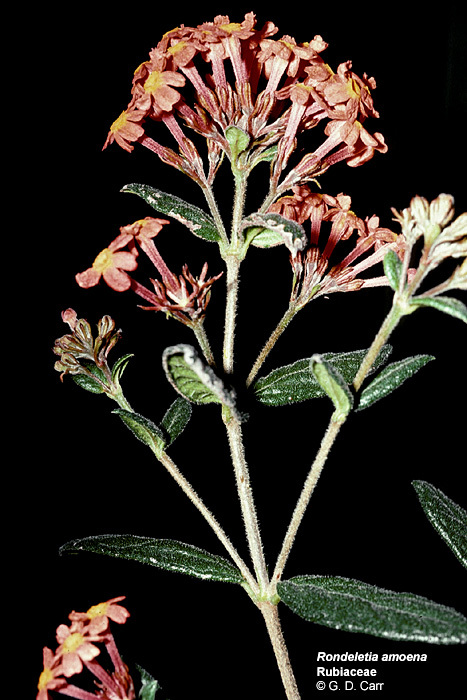 Rondeletia amoena. 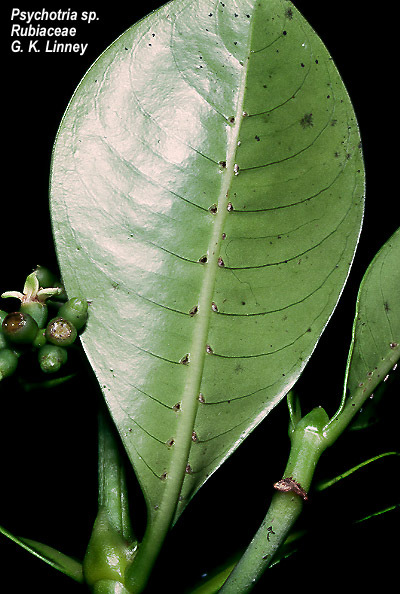 This photo shows opposite leaves and one of the interpetiolar stipules. 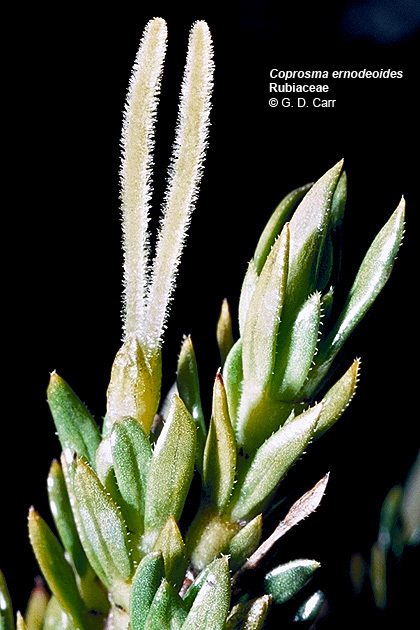 The matching stipule of the pair is out of view on the other side of the stem. 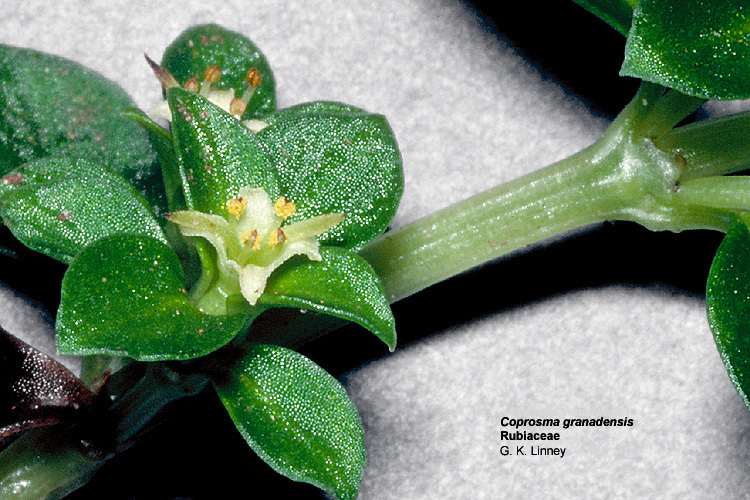 Spermacoce assurgens, buttonweed. 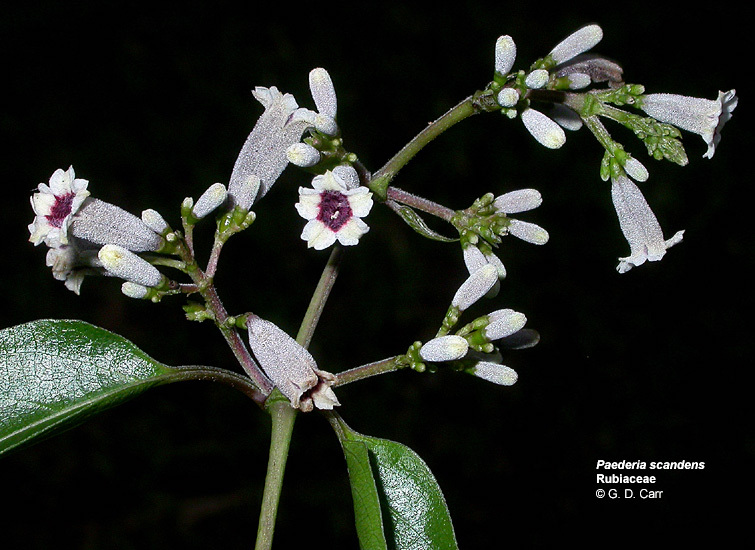 This weedy species has 4-merous flowers. Note the tubular corolla and the small calyx teeth on the inferior ovary. 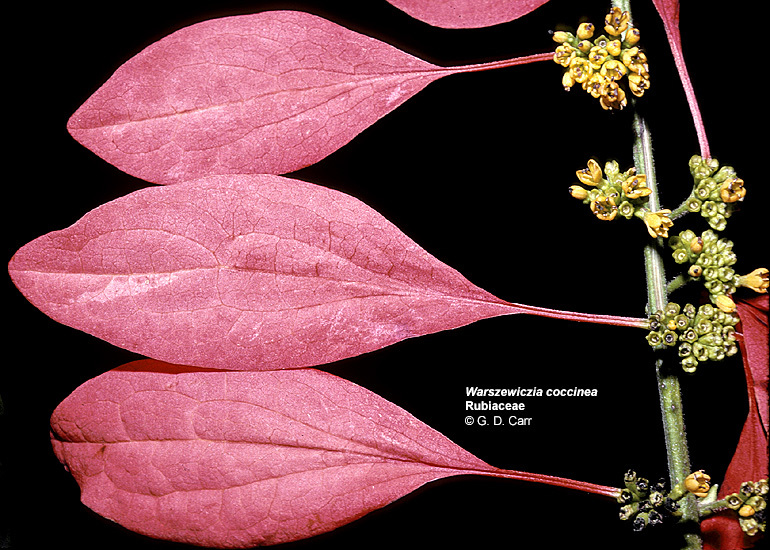 Warscewiczia coccinea, wild poinsettia. 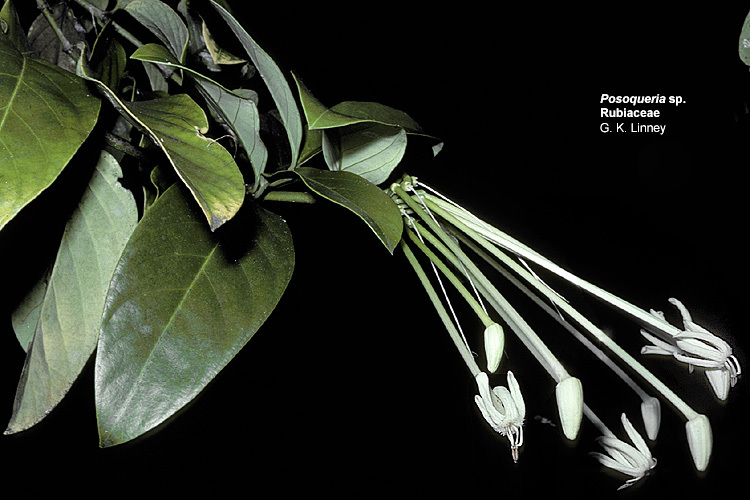 This unusual species has one calyx lobe of one or two of the peripheral flowers in each cluster greatly enlarged and brightly colored. 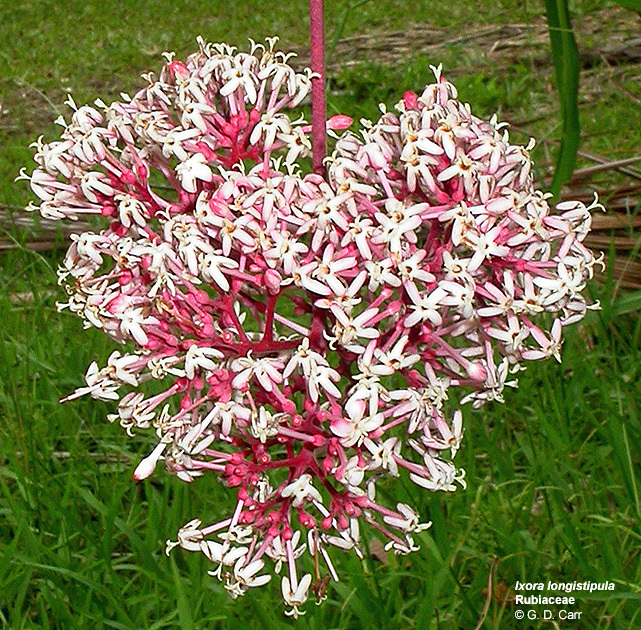 This is a type of loosely organized pseudanthium or cluster of flowers that mimics a single flower as the attraction unit for pollinators. 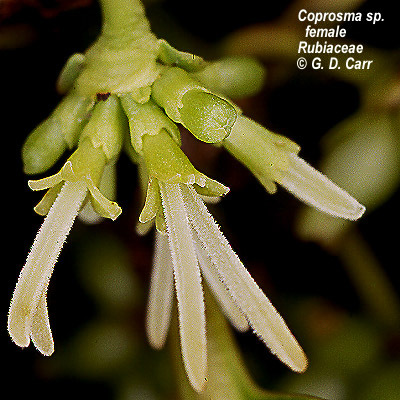 Note the otherwise tiny calyx lobes, the tubular yellow corollas and the inferior ovaries.